E2M introduces its latest testing solution, the eM6-A8 electric 6 degree of freedom shaker platform, featuring E2M’s unique patented overdetermined technology. | E2M Technologies B.V.
E2M Technologies , is proud to announce that it’s unique overdetermined motion systems for high frequency and safety critical simulation and testing applications, has been chosen by a leading German automotive research institute to be used for a demanding testing application. A combination of large excursions, large velocities (> 1m/s), large accelerations ( 4g) and high frequency response (>20 Hz for all DOFs) is very hard to achieve with traditional hydraulic or electric hexapod motion systems. 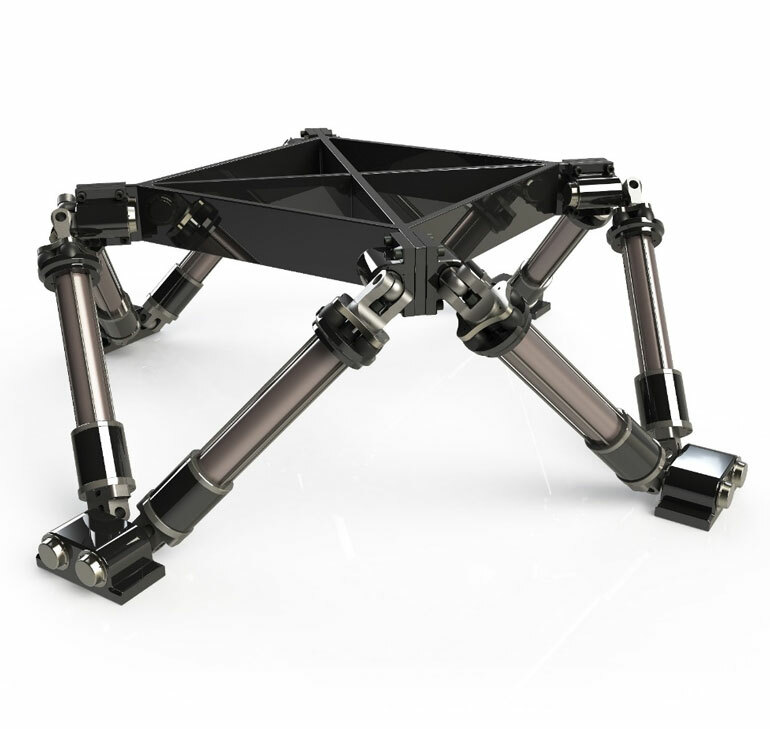 E2M’s smart all electric octopod offers an extremely high intrinsic stiffness and superior performance. It offers a modern, clean solution for this application. The purpose of the testing platform is to test AdBlue tanks in sub-zero temperatures. A climate chamber will be installed on top of the eMove motion system and includes the AdBlue tank. The combination of large excursions, velocities , accelerations and high frequencies are necessary to faithfully reproduce the conditions experienced during the lifetime of this component. In addition, an official certification of the system as well as the validation of the analyzed data will be accomplished by the customer. Ultimately, the fully electric eMove Octopod design sets a new standard in the automotive testing industry towards full electric testing devices. The system will be operational in spring 2018. An official introduction of the AdBlue test set-up including the overdetermined motion technology from E2M to the automotive industry is planned for autumn 2018.